Nissan Motor Co., Ltd. today previewed its electric vehicle (EV) platform on a Tiida-based prototype to demonstrate the superior driving pleasure of a pure zero-emission vehicle. 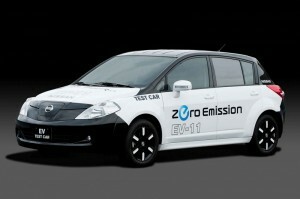 It also showcased a sophisticated EV-IT system developed to support electric driving every day of the year. The dedicated EV platform is comprised of a highly rigid body, high-performance motor, compact lithium-ion battery with high power output and energy capacity, delivering outstanding driving performance and safety, while offering a quiet and peaceful driving experience – a unique feature of a fully-electric drivetrain. The in-house developed electric motor delivers 80kW/280Nm for high response and powerful acceleration. Nissan’s unique motor control also contributes to the vehicle’s seamless acceleration. The 24kWh laminated compact lithium-ion battery pack is placed under the EV’s floor for more efficient packaging, without compromising cabin or cargo space. The battery layout also allows smooth underfloor air-flow which helps reduce drag. Additionally, the regenerative brake system employed to recharge the battery during deceleration and braking extends the driving range to more than 160km under a full charge. High durability is achieved by employing an additional frame for the battery pack to significantly improve the rigidity of the platform. The combination of a high rigidity platform and electric powertrain minimizes vibration and external sounds to produce a quiet and pleasing drive.